As part of Canada's 150th anniversary celebrations and in recognition of the importance of transportation and mobility design engineering for the future of Canada, the Canadian Academy of Engineering (CAE) has partnered with the SAE Foundation to offer an undergraduate scholarship in transportation and mobility engineering and an award for outstanding aerospace design by university students. Three student members of the Formula ETS club talk about their interest in designing and building a high-performance single-seat race car for the Formula SAE engineering design competition of the Society of Automotive Engineers. Click here to watch the video. The Canadian Engineering Memorial Foundation presented awards and scholarships to 15 engineering students across the country, including 3 Québec students. Aimée-Line Emond and Marianne Leroux from the Université de Sherbrooke and Andrea Saliba from McGill University received scholarships from the Canadian Engineering Memorial Foundation (CEMF). Twelve other students from across the country received these scholarships. This issue highlights the contribution of the student clubs that are active in engineering schools and faculties across Québec. It includes an interesting article about students involved in a formula SAE project. After November 30, 2017, it will be too late! Electric car: 6 minutes of recharging for a 320 km range! Starting in 2019, it will be possible to recharge your car in the same time it takes to fill a tank, according to Japanese firm Toshiba. It has created a new car battery that recharges in 6 minutes and offers a 320 km range. How do you get noticed by employers? Do you know how to set yourself apart from your peers and get noticed by future employers? Join a student club! Think about it for a minute or two…Learning to work on a team, manage projects and budgets, and apply theoretical knowledge while innovating are highly-prized skills by employers! That is exactly what you will learn to do in a student club. 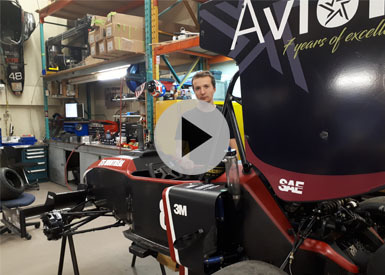 ETS students Léandre Joncas and Alex Guérin explain what made them want to become members of the Formula ETS club, one of 500 university teams in the Formula SAE (Society of Automotive Engineers) international engineering competition.